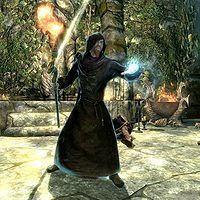 Malkoran is a Breton necromancer who resides in Meridia's Temple. You are tasked with removing him from the temple during the Daedric quest The Break of Dawn. He is accompanied by many corrupted shades which he has created from the casualties of the ongoing war. He has an extremely powerful frost spell that can potentially kill in one hit, and a great deal of health, making him extremely hard to kill. Malkoran's Shade spawns upon Malkoran's death. Malkoran's Shade is a floating, wraith-like skeleton surrounded by a dark mist. It knows Destruction spells of all elements, and it will also use Wards to protect itself during combat. Malkoran may spawn with a Destruction staff. If so, he will use it in preference to his own spells, making him far less deadly at early levels. As powerful as Malkoran may be, his shade seems bugged; it will not move through the doorway to his main chamber. This allows you to stand at the top of the stairs and shoot his shade to death with spells or arrows. Reanimating the original body of Malkoran and killing him again will cause a second shade to spawn. The shade may still be hostile to you, and will drop his 250 gold again when killed. 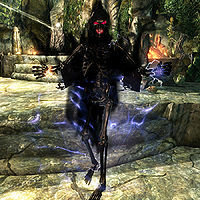 Owing to his range of spells, he is an extremely powerful candidate for dead thralls. This page was last modified on 1 November 2018, at 06:44.